Doesn’t this also introduce some memory issues on the server? Because sessions are kept in the server’s memory longer sessions for anonymous users will stack up and could lead eventually to out of memory errors? Oh absolutely – but I don’t think a refresh once every 29 minutes is going to make any difference – there is definitely a balance. I don’t like having to use this as a solution but because the XPages failiover once the session is lost is not good/non-existent then I am not sure there is an alternate.The user experience is compromised by selecting an action and at best nothing happening – because you might not be timed out of the web session you are still “logged in” but all your scoped variables are gone the results are not good. An alternate would be to tell the user the session is expiring and not allow them to continue with their actions once they return – but that requires even more effort….something to think about. Would an Alternative be – maybe after keeping alive for x number of minutes… to then just expire the session and redirect to a “Your session has expired” page? similar to what most financial institutions do if your idle too long? Guess I’m asking what that effort might look like – to add a redirect to that function. Absolutely – but it all depends on the expectation of the clients and the requirements. Two comments/questions. I have also run into this issue. The server side events on a radio button/select control stop working when the session times out and the user can change the values but the page never refreshes until they reload the entire page. 1. How can you tell if the session has timed out? It has to be a client side solution…I couldn’t figure out something. 2. So, I ended up using the meta tags to reload the page every x minutes. That seems to fix the issue. Probably more of a sledge hammer approach compared to Mark’s approach above! Howard – yeah the META tag version refreshes the whole page – mine only a small hidden section so any current edits are not lost. You could tell if a session has been lost by setting a sessionScope variable and using AJAX to make a call to the server and load it up on a separate XPage in the background – but you’d have to query the server to find out, the client cannot know if the session is lost without asking. Of course every time you ask you are also keeping the session alive. The bug had in fact been identified a few weeks ago and a fix had just been submitted to both n/d next (guess the number) and 853, which makes a hot fix possible while awaiting for the next fix pack. It is an unfortunate regression. FYI, I’m using this control in every app, with a session timeout of 5 mins, and one page in memory for fast Ajax requests. Now, most of my pages make use of the dynamic content control, so the user is rarely navigating between pages. This is how I made my apps the most responsive! Mark – just curious on what the thought process is for using XSP.partialRefreshPost vs XSP.partialRefreshGet? Mike – I have no proof of this but I figured that a POST was more likely to force the session to stay alive than a GET. I did not test both. I am having a similar issue where users are keeping a page open entering data for extended periods of time. To fix this I am doing an ajax call to essentially, as mentioned above, keep the session alive. This seems to work from the point of view of whether the user is logged in, but It seems as if occasionally the user does stay logged in, as in they have access to click buttons, do partial refreshes, and submit etc, as defined in the acl, but the Scope variables are dumped, in particular sessionScope. I am wondering if anyone else has noticed this using this keep alive method of maintaining a session? This is the problem I experiences with the EXTLib Keep alive – just making an ajax call to the server keeps the LTPA Authentication Session active but not the XPage session. My feeling is that unless something on the XPage is touched then it is not kept alive. Yes, you are exactly right! 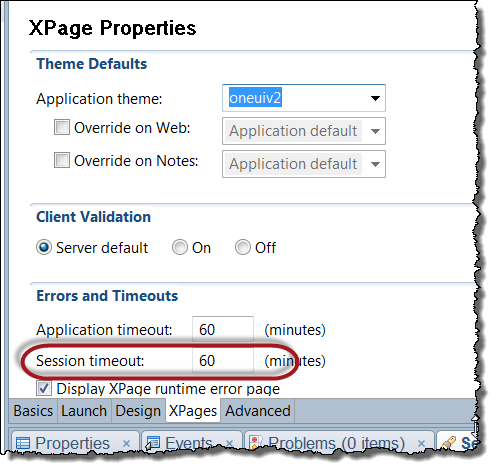 The ajax method keeps the auth session, but the xpage in memory is sometime lost along with some of the variables. When you click a coded action it reloads the last url request, which in some case is a new blank document, and in other is a previously saved document that no longer has your recent changes, hence it appears to have lost the data. The interesting thing is that it does not appear to be at a set interval, maybe its the Servers garbage collection, or based on active resources/memory? Anyway your solution works great, thanks for posting! Right, that’s what I thought but I am seeing this problem regardless of the Session length setting and at intervals that seem to have no reference to a set time. Setting was at 3 hrs, now its at about 60min, and the dropped memory happens at 10 min, 15 or 20, very random I was actually originally going on that hunch that it was my development dropping sessions which as you say is also the case, and makes sense from the java perspective. I would like to know what more are the main reason for this memory leaks besides rebuilt & refreshing the app. Do we have good information to know about it. Besides above, I saw Me Medusa from Nathan Freeman (which I couldnt install in firefox 21 and YourKit (Java profiling) to observer the heap memory in Server side for the facet page. If you know any other plugins for the server side profiling, please let me know.